Commercialization or Just a Cup of Coffee? Do we want brand names in OUR national parks? Would they diminish what makes OUR parks unique and special? Why is a 13 year-old girl holding a Restore Hetch Hetchy banner in the middle of the Grand Canyon? The nationwide outcry over the 1913 Raker Act led directly to the passage of the National Park Service (Organic) Act three years later - an act intending to ensure national parks were managed for national, not local, benefit. The Organic Act discouraged but did not explicitly ban building dams in national parks, and attempts to build dams in Yellowstone in the 1930's were stopped. 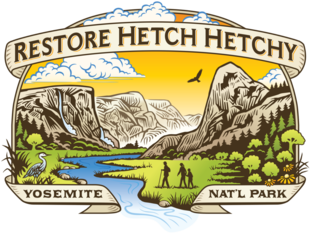 Restore Hetch Hetchy 2018 Annual Dinner. Tickets now on sale! Join us and very special guests Lee Stetson and Obi Kaufmann for our 2018 Annual Dinner. What could be a greener way to celebrate St. Patrick's Day? Online tickets can be purchased at Eventbrite (fee required). Tickets can also be purchased by contacting Julene Freitas at 510.893.3400 or email julene@hetchhetchy.org. You may also download form to purchase by mail. "The ultimate removal of the reservoir would make possible the restoration of Valley a few miles from Yosemite Valley and, amazingly, a near twin of that extraordinary gift of nature." Imagine yourself in Hetch Hetchy on a sunny day in June, standing waist-deep in grass and flowers, while the great pines sway dreamily with scarcely perceptible motion."